I love a good tarty lemon tart. I have a small lemon tree but it yields so many lemons. The good thing is that my Hubby loves Tarte au citrons or lemon tarts and I love making them. I have made many tarts in my time and I’m constantly looking for an easy recipe. 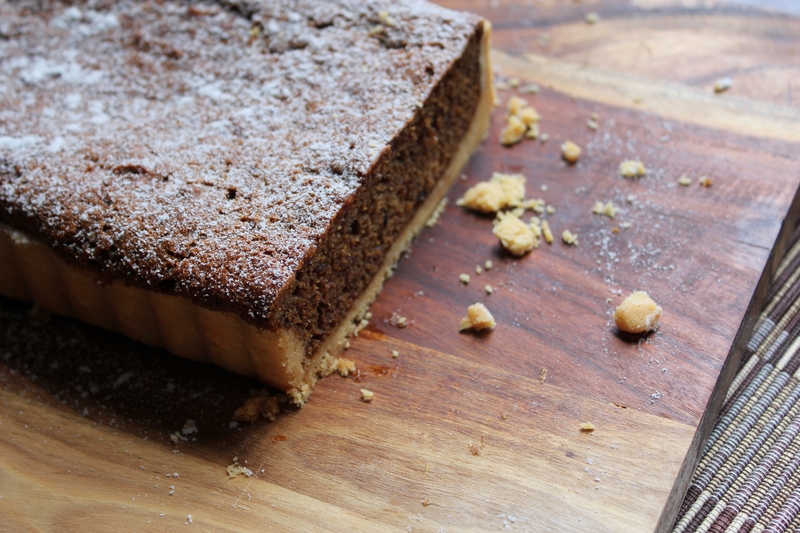 I have found an Eric Lanlard tart shell recipe and this is the one I use all the time now. The only difference with mine is that I use a food processor to make the job easier and faster. He uses the traditional method by rubbing the ingredients together using your hands. Feel free to do either of those methods. The filling is inspired by Mary Berry. Sometimes I use the same filling recipe to make a curd. I just cook it slowly untill thick. This filling is quite tart, and that’s the way hubby likes it, you can use less lemon zest if you don’t like it as tart. This recipe for the tart shell makes more than one shell. You can freeze any left overs. It can keep for about 2-3 months. Just defrost in the fridge for 24 hours. In a bowl of an electric food processor add the flour, sugar and butter. Pulse until mixture resembles bread crumbs. Add the rest of the ingredients and process until the mixture comes together. Turn off as soon as the dough comes together into a ball. Turn out onto a lightly floured bench and knead together for a minute. Roll into a ball then cover with clingfilm and chill for about 30 mins in the fridge. After 30 mins, roll our the pastry on a lightly floured bench slightly bigger than your tart tin. Grease a loose bottom tart tin then gently lift the pastry onto the tin and press firmly but gently into place ensuring there are no gaps between the pastry and the tin. Let any excess pastry hang over the edge then trim. Prick the base with a fork cover and then chill the pastry for 30 mins. Blind bake pastry. Place a large piece of baking paper over the base and sides of the pastry and fill the base with baking beans. Bake for 10-15mins or until just set, then remove the paper and beans and cook for a further 10mins or until golden. While the tart is baking, make the filling. In a large bowl, mix together all the filling ingredients. Pour filling into baked tart shell and bake 30-35mins until there is a slight wobble in the middle. Leave to cool slightly before removing from the tart tin. I love sticky date pudding. It’s my safety net dessert on a restaurant menu. When I go out for dinner, I check out the dessert menu first. I look for the sticky date or something similar first. It’s my back up plan. If I don’t see a dessert that appeals to me, I go to my back up… the sticky date. 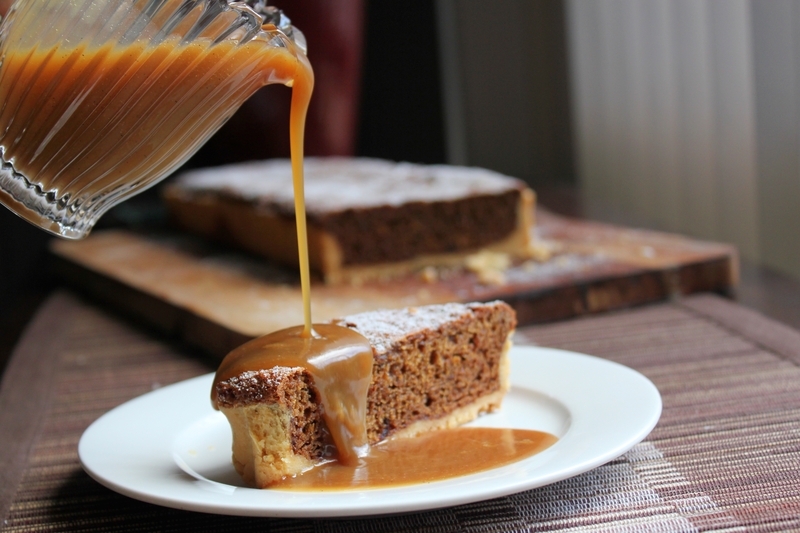 I found a recipe that turns the sticky date pudding into a baked tart. 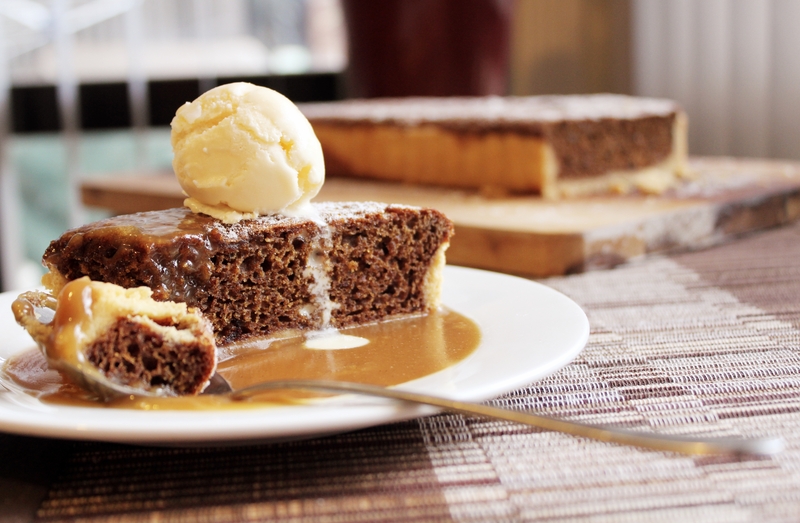 Serving it with toffee sauce and ice cream makes it a crowd pleaser. Who doesn’t love a good sticky date?! In a food processor, combine the flour, butter and sugar. Pulse until mixture resembles breadcrumbs. With the motor running, add the yolk and water until it forms a dough (add more water if needed). Turn onto a lightly floured surface and knead lightly until smooth. Wrap in plastic and chill for 30mins. Meanwhile, start the filling. In a saucepan over medium heat, place the dates and milk. Bring to just below boiling point, then remove from heat. Stir in the bicarb of soda, then stand for 30 mins or until dates have softened. 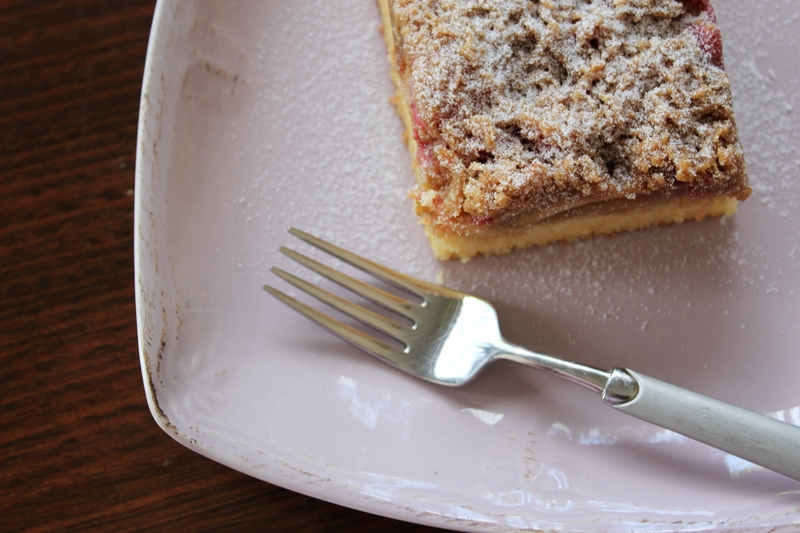 Lightly grease a 36cm x 12cm loose bottom rectangle tart tin. Roll out the dough to 5mm thickness. Ease into the tart tin and trim the edges. Chill for another 10 minutes. Preheat the oven to 180degC (160degC fan). Blind bake the tart shell with weights for 8-10 minutes. Remove the weights and bake for a further 3-5 minutes until golden and dry. Place the dates and milk in a food processor with the vanilla and pulse to combine. Transfer to a bowl and fold in the flour, eggs, golden syrup and brown sugar until just combined. Set aside. For the toffee sauce, place all the ingredients in a saucepan over low heat. Stir until sugar dissolves. Cook for 2 minutes or until slightly thickened. Pour 1/3 cup of the toffee sauce into the tart shell, then spread the date mixture on top. Bake for 20-25mins until just set. Cool in the pan for 5 minutes. Serve warm, sliced with the remaining toffee sauce and a scoop of vanilla ice cream. I like to try to get creative in my kitchen. I love to bake for my family. It helps that my family loves to eat. I like to bake every weekend trying new recipes and new ingredients. I am fortunate at times when I get approached to try new products. Sometimes the products have been around for a while however, a new range have been launched. 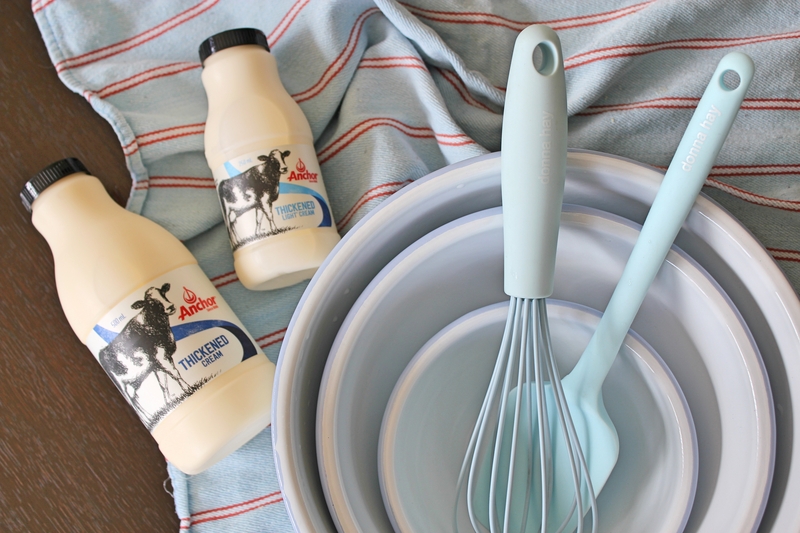 The new Anchor cream range is made with 100% Australian dairy and is designed with foodies and cooks in mind. The bottles come in unique sizes. 1 cup (250ml) and 2 cup (500ml) and has markers on the side of the bottle to ensure precise pouring. This all helps following a recipe be hassle free. Anything that makes my baking easier is always welcomed in my kitchen. 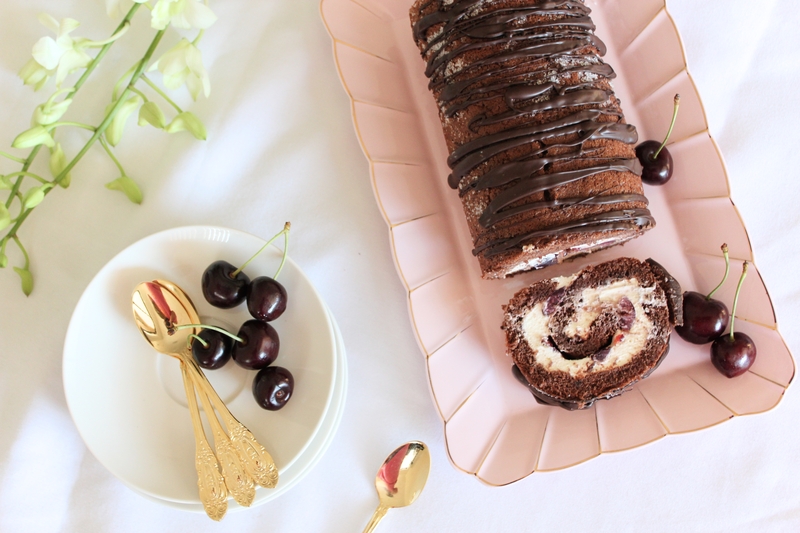 To mark the launch of the new Anchor range, I have come up with a recipe that I want to share with my readers. Sift half the flour and cocoa powder over the mixture and gently fold in with a metal spoon well before adding the rest of the flour and cocoa powder. Mix ensuring it is combined well and there are no lumps. Meanwhile, prepare baking paper by sprinkling some caster sugar. When cake is baked, turn out the cake onto the paper with the top of the cake facing the down. Place another sheet on top of the sponge and roll it up loosely. Have the short end facing you and roll. Leave for 5 minutes then unroll. Leave to cool completely on a wire rack. Whip up the Anchor thickened cream, sugar and vanilla until soft peaks form. When the cake is cool, brush on the kirsch and then spread the cream onto the cake, leaving around a 5cm border at the edges. 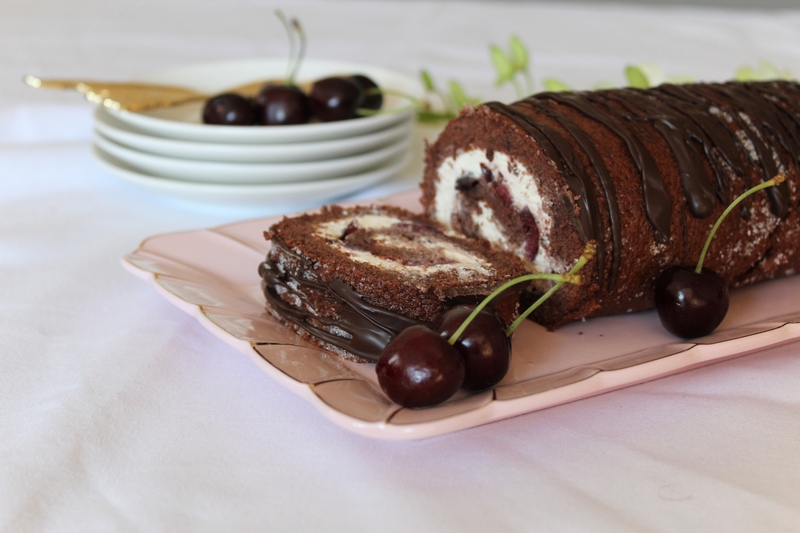 Sprinkle the cherry halves over the cream and then re-roll ensuring the seam is at the bottom. 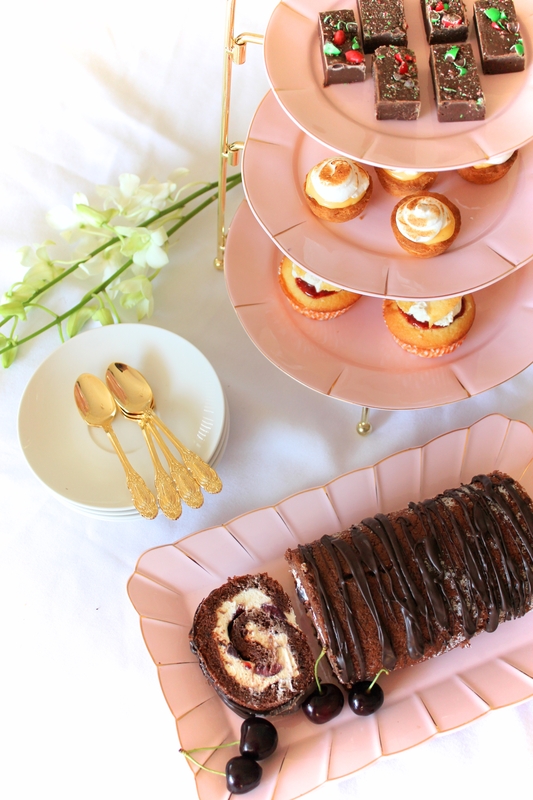 Platter and 3 tiered cake platter used in this post are Maxwell and Williams blush range. The New Anchor cream range can be found at your local Woolworths. 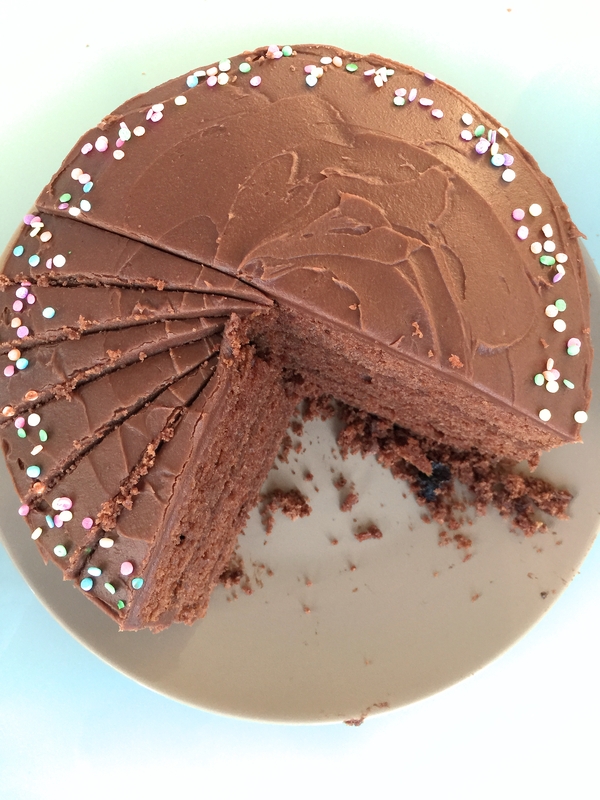 Giveaway: Cake, Bake and Sweets show 2015. 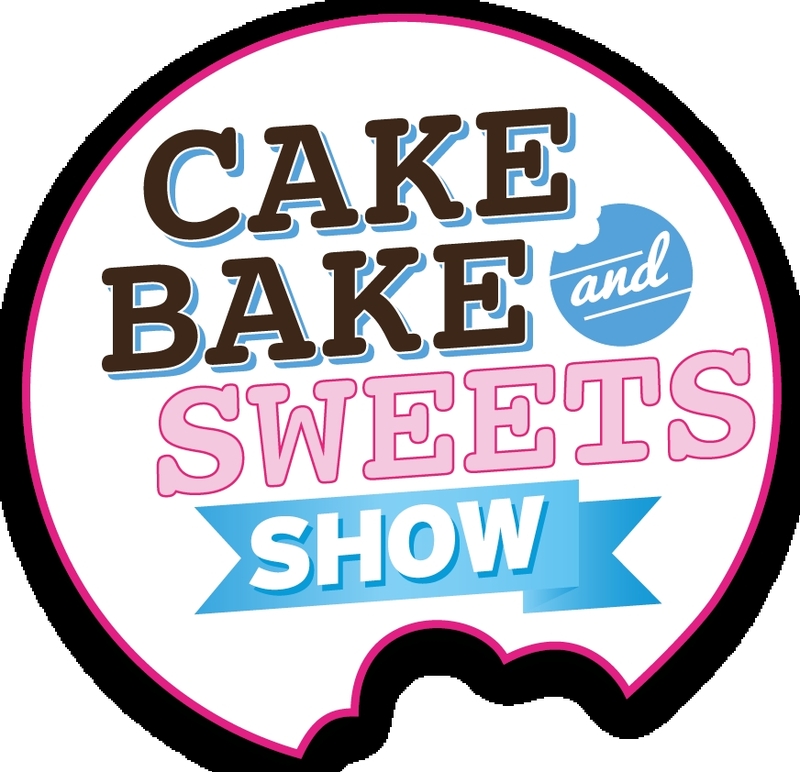 The Melbourne Cake Bake and Sweets Show is back! It will take place at the Melbourne Convention and Exhibition Center on the 23rd to 25th October 2015. If you have a passion for baking, like myself, or just eating sweets, like Hubby, then you’ll want to head to the event which is devoted to all things baking and the art of baking. Guests will get the chance to see a line up of some of the best international and home grown baking stars. 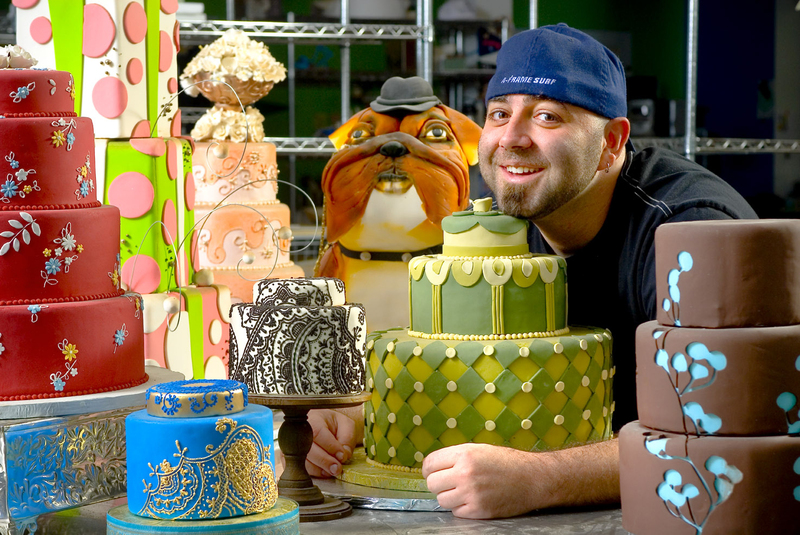 Guests like the star or Ace of ckaes Duff Goldman and many of Australia’s favourite patissiers will have live demonstrations. You can learn all the tricks of the trade. And oh, don’t miss out my friend Thanh Do’s workshop on how to be an expert on Social Media. I went last year and had a ball. I left feeling more inspired about baking. 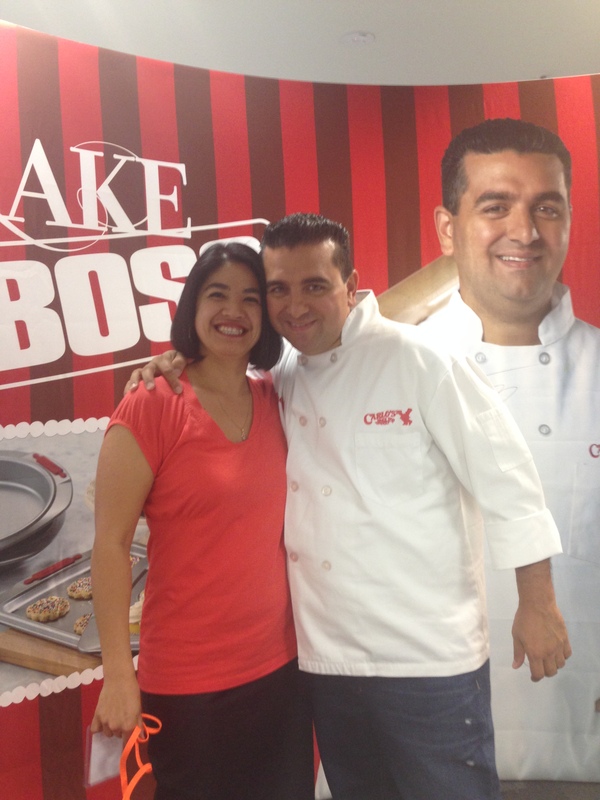 I was also fortunate enough to meet one of the greatest cake bakers I know, the Cake Boss himself Buddy Valastro. I’m happy to announce that I have a double pass to give away to this fantastic event and it’s easy to enter. I will choose the winners randomly and contact the successful reader via email so please make sure you provide a valid address. Leave a comment at the bottom of this post stating why you would love to attend the show this year. Share this post on Facebook and Twitter. July is ice cream month. Even though it’s the middle of winter here in Melbourne, I can’t resist a large bowl of ice cream, especially if it’s Harry’s Peanut butter fudge or triple choc brownie. After chocolate, ice cream was voted as one of Australia’s top comfort foods that makes us feel better. Australians like to turn to comfort food to forget about the bad day they just had or to temporarily forget the daily stresses they face. For me, I like to wind down after a long day at work by sitting under a cozy blanket on the couch in front of the TV while eating my way through a tub of ice cream. 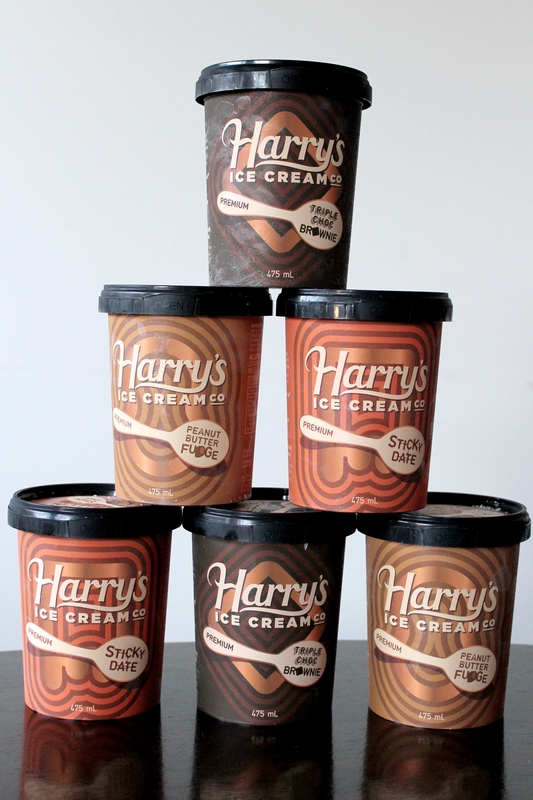 To celebrate ice cream month, Harry’s ice cream sent me a few tubs to create something delicious. This was Hubby’s idea. He used to have these growing up in England. I have to say, it wasn’t a thing here in Australia but it should’ve been! It’s easy so you don’t really need a recipe for it. You can layer anything you like. I set some jelly at the bottom of the glass and also set the remaining in a separate bowl. When ready to serve, I layered a scoop of vanilla ice cream, strawberry and chocolate syrups, meringue, more jelly and of course, Harry’s ice cream triple choc icream. I topped with whipped cream (from a can, I know, the horror!). 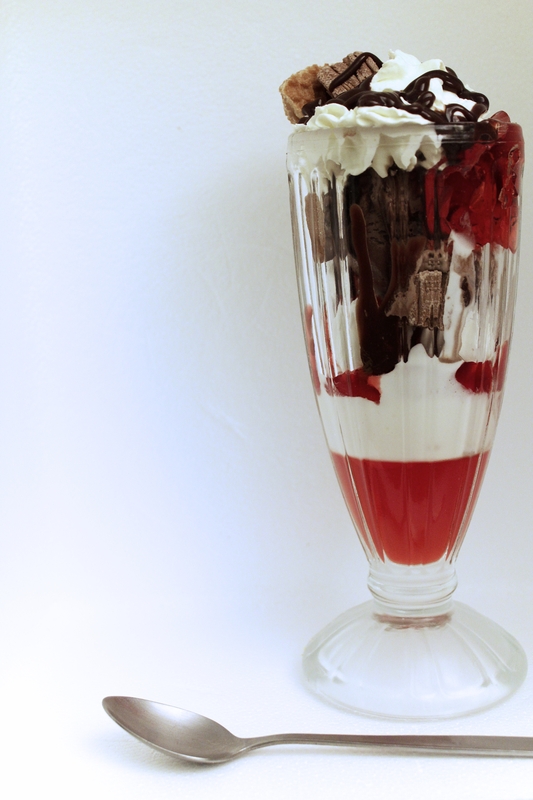 Garnished with a glace cherry, a wafer and a Flake. 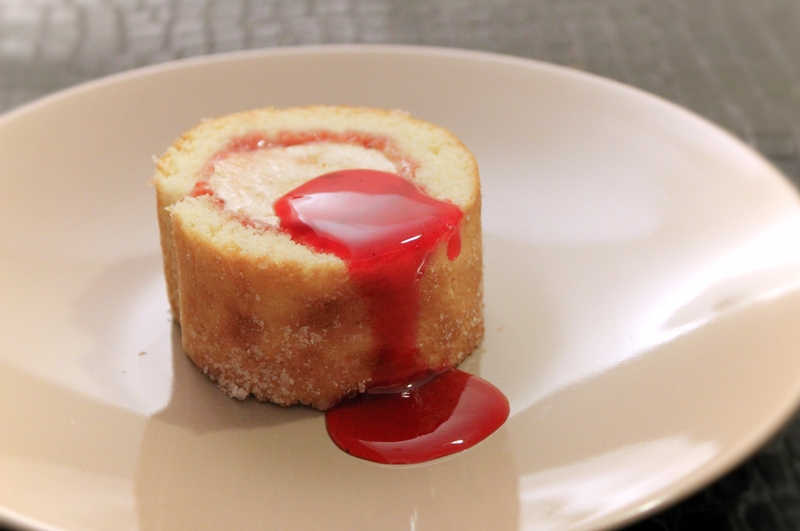 Next I created the peanut butter and jelly arctic roll. This is another ice cream dessert that I didn’t know much about until my adult years. 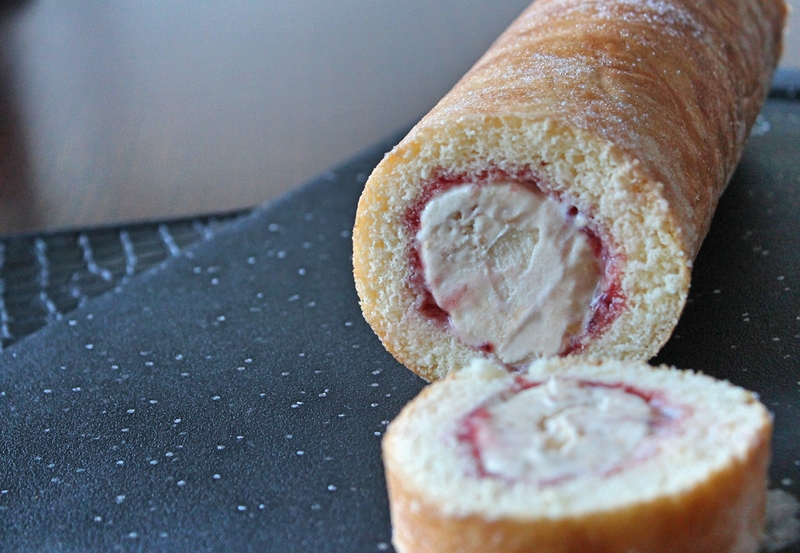 An arctic roll is a British dessert, traditionally made of vanilla ice cream wrapped in a thin layer of sponge cake, which has raspberry sauce spread onto it. I chose to use Harry’s peanut butter fudge ice cream. You can use any ice cream flavour you fancy, really. Take the ice cream out of the freezer to soften a little, enough to be able to mould. Put on a piece of baking paper and shape into a thin sausage 25 to 30cm. Wrap in the baking paper and put in the freezer until solid. To make the Swiss roll, whisk the eggs and sugar together in a large bowl for several minutes until pale and triple in volume. The mixture should hold a tail when the whisk is removed. Sift the flour over the egg mixture and fold in lightly. Fold in one tablespoon of warm water. Pour the mixture into the tin and smooth it out and make sure it reaches all the corners. Bake for 10-12 minutes or until golden brown. 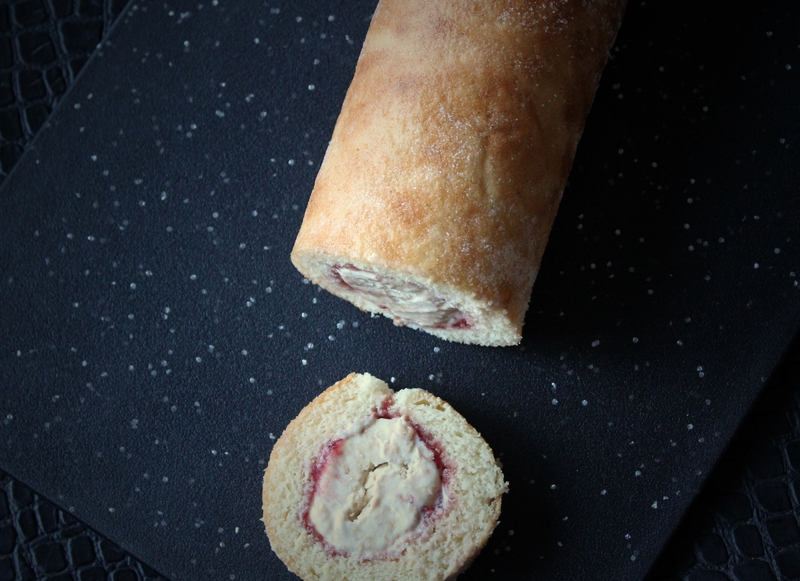 Cut a piece of baking paper a little larger than the Swiss roll tin and lay it on the bench. Sprinkle with caster sugar. Turn out the cooked sponge onto the baking paper, base upwards. Carefully peel the paper from the base of the sponge. Leave to cool completely. To assemble the roll, trim the long edges of the sponge so it’s neat. Spread the jam over the sponge, leaving a 2cm gap along the edges. Unwrap the ice cream and place lengthways across the sponge. Use the baking paper to help you roll the sponge around the ice cream. Use a bread knife to trim each end of the roll. Place on a plate and serve straight away. To celebrate ice cream month, Harry’s ice cream co is delivering ice cream to people who are in need of an ice cream emergency. DAILY PRIZE: 10 Tubs of ice cream delivered right to your doorstep! Tell Harry’s Ice cream Co why you’re screaming for ice cream and you could find an emergency supply of Harry’s Ice Cream delivered to your doorstep. Check out their Facebook page here for more details. It’s nearly time for the Good food and wine show in Melbourne again. I have gone almost every year. I love to get new ideas and inspirations from well renowned chefs and new produce I am introduced to. This year Melbournians will get the chance to see popular UK chef Ainsley Harriott. He has been appointed the face of this year’s Good food and wine show in Melbourne. He will be present all 4 days during the show 5-8 June . Ainsley will share tips and handy ticks during his live cooking demonstrations. I have followed his career for many years and have collected a lot of his cook books. I have also managed to cook many recipes from his books. In celebration of his appearance in this year’s show I have decided to share one of my favourite recipe of his. The chocolate heaven cake. This cake is to die for. It really is heavenly. Hubby says it’s light, fluffy and rich all at the same time. In a heatproof bowl, break the chocolate into pieces and melt over a pan of barely simmering water. Remove from the heat, stir until smooth and cool slightly. In a large bowl, cream together the butter and sugar until pale and fluffy. Gradually add the eggs, mixing well after each addition. Add the vanilla extract and melted chocolate and mix until smooth. Sieve together the flour, baking powder, bicarb soda and cocoa. Fold into the creamed mixture in alternate batches with the sour cream. Mix well between each addition. Divide the mixture evenly between the 3 tins and bake for about 25 minutes, until the cakes are springy to the touch and a skewer inserted into the middle of one of them comes out clean. Cool for 5 minutes then turn out onto a wire rack to cool completely. Once the cakes are completely cold, make the frosting. In a large bowl, melt the butter with the chocolate chunks set over a pan of barely simmering water. Melt until smooth, stirring occasionally. In another bowl, whisk together the icing sugar, vanilla extract and milk until completely smooth. Add the melted chocolate and butter and mix until combined. Set aside for about 30 minutes to thicken slightly. Place one of the cakes on a serving plate and spread with a little frosting. 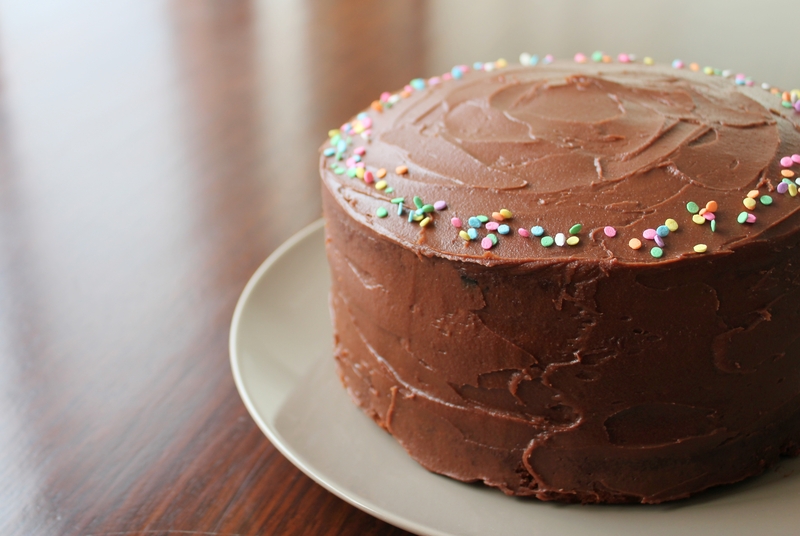 Cover with another cake and more frosting. Top with the remaining cake and lightly press all the cake layers together. 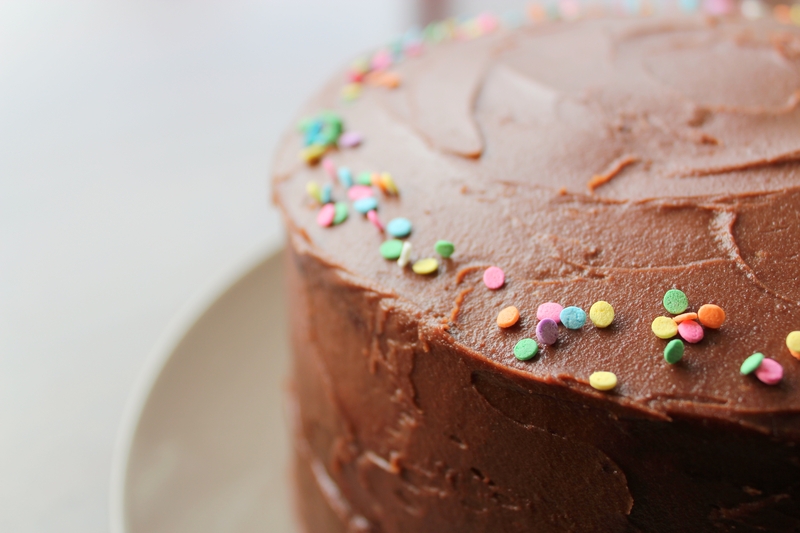 Use a palette knife to spread the remaining frosting evenly over the top and sides of the cake. Would you like to attend the Good Food and Wine show in Melbourne? I have a double pass to the show to giveaway to one of my readers. It is simple to enter. Just leave a comment below and share this post on Facebook and twitter. This competition is only for readers who are able to attend the show in Melbourne. The competition does not include flights or accommodation. Competition ends midnight 24th may 2015. I will contact the winner via email. To be honest, I’m not familiar with streusel. I saw the recipe for rhubarb and apple streusel and I was curious. Hubby is not a fan of rhubarb so I substituted it for fresh raspberries instead. I’m glad I tried it because it was well accepted by the family. 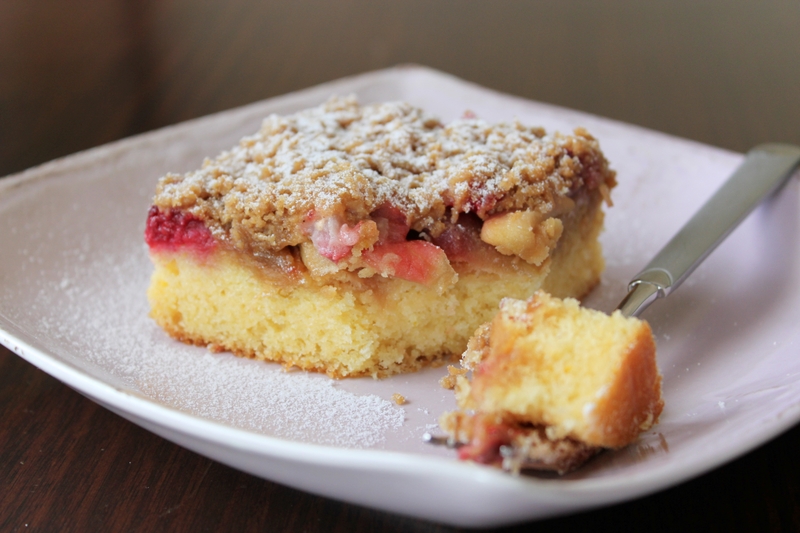 I like the spongey cake at the base, tangy taste of the fruit, then the sweet streusel topping. Definitely will be making this one again. Make the streusel: Using a food processor, blend the flours, sugar and cinnamon until combined. Add the butter and process again until ingredients come together. Wrap in cling film and freeze. Stir in the flours and custard powder. Press the mixture over the base of the pan. Bake the base for about 20 mins. Cool for 15 mins. Meanwhile, in a saucepan cook the apple, honey and orange zest, stirring occasionally until the apples are tender. Turn off the heat then add the raspberries. Cool for 15 mins. 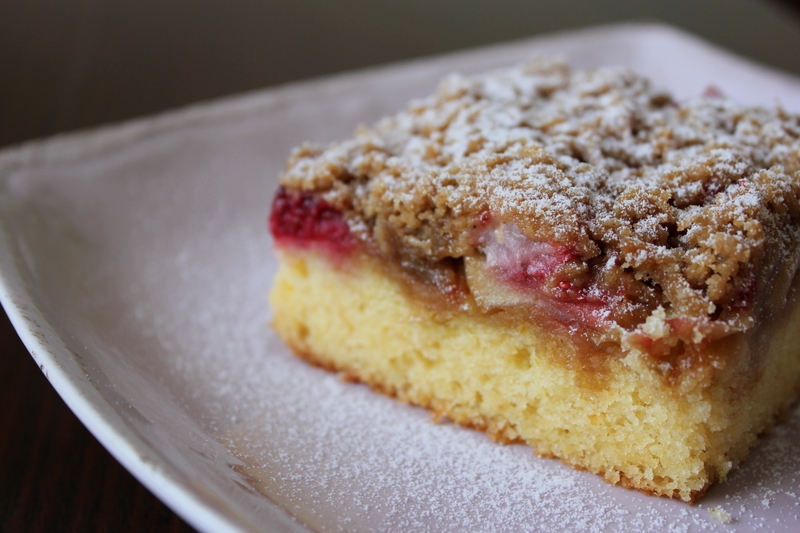 Spread the apple and raspberry mixture over the base then coarsely grate the streusel over the fruit. Bake for about 15 mins.